Do your options feel like "Heads they win, Tails you lose"? Active Adult Communities usually offer a choice of spacious homes rather than apartments, often with a clubhouse in which a variety of activities are planned for residents. Monthly fees may cover services such as housekeeping and maintenance, but meals are usually not included. Home ownership model. Senior Apartments are apartments for seniors who are totally independent. Meal service, activity, programs and services usually aren't included. It is a rental model as compared to home ownership. Independent Living is designed for seniors who require little or no assistance with the activities of daily living, independent living units provide services for residents such as housekeeping, laundry, transportation and meals. Residents of independent units may have some health care services provided by in-house staff or an outside agency. These residents pay a rental rate or monthly fee. This is the start of communal living. Congregate/Group Homes are usually single family homes licensed to provide assistance with medication, bathing and dressing. Depending upon the training of the caregivers, services can be similar to Assisted Living. Assisted Living is a long-term care option that combines housing, support services and health care, as needed. Assisted living is designed for individuals who require assistance with everyday activities such as meals, medication management or assistance, bathing, dressing and transportation. Some residents may have memory disorders including Alzheimer's, or they may need help with mobility, incontinence or other challenges. Assisted Living communities for individuals with Alzheimer’s disease or related dementia are often referred to as “Special Care Units (SCUs).” Often housed in a special wing with additional security, cueing devices and other specific architectural features these areas are state licensed and provide programming specific to the population being served. SCUs are staffed with individuals who are specifically trained to work with those who have some form of dementia. A Nursing Facility provides care of chronic conditions or short term convalescent or rehabilitative care, for which medical and nursing care are indicated. Some residents are admitted for short stay following hospitalization. Facilities are licensed to provide skilled nursing services under the supervision of licensed nurses. A Continuing Care Retirement Community (CCRC) is a community that offers several levels of assistance, may include independent living, assisted living and skilled nursing care. 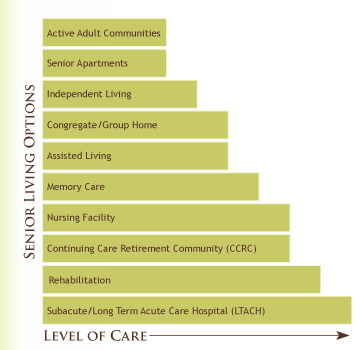 It is different from other housing and care options for seniors because it usually provides a written agreement or long-term contract between the resident (frequently lasting the term of the resident's lifetime) and the community, which offers a continuum of housing, services and health care system, commonly all on one campus or site. 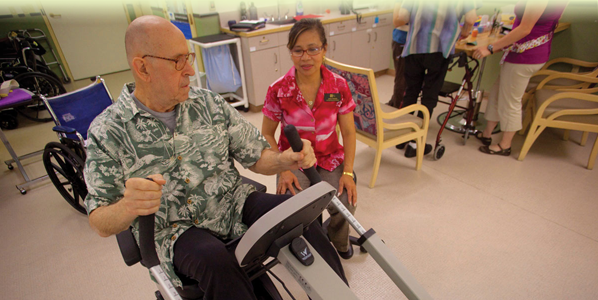 Comprehensive rehabilitation services include inpatient and outpatient treatment designed to restore and strengthen abilities. Geared toward returning patient to previous level of independence. Focuses on high therapy versus complex medical treatments. Sub Acute/Long Term Acute Care Hospital (LTACH) is generally more intensive than traditional nursing facility care and less intensive than acute care. Nursing facilities are now dedicating entire wings, even entire facilities to provide high-tech medical care. Care is comprehensive inpatient care designed for someone who has an acute illness, injury, or exacerbation of a disease process. It is goal oriented treatment rendered immediately after, or insted of, acute hospitalization to treat one or more specfic active complex medical conditions or to administer one or more technically complex treatments, in the contect of a person's underlying long-term conditions and overall situation. Hospice care is meant for the time when treatment can no longer help you, and you are expected to live six months or less. Hospice gives you alliative care, which is treatment to help relieve disease-related symptoms, but not cure the disease; its main purpose is to improve your quality of life. 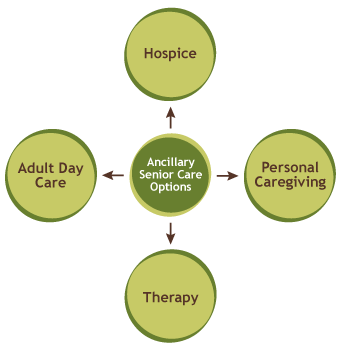 Hospice care can be given in the patient's home, a hospital, or senior living community. A daily non-overnight stay at a Senior Living community where care includes programs, services and facilities designed to assist physically or mentally impared adults. These are persons who might othewise require institutional or long-term care and rehabilitation. There are two general purposes for adult day care. The first is to provide an alternative to placement in a residential institution. The second is to create a respite for caregivers, often the children of the persons for whom the care is being provided.